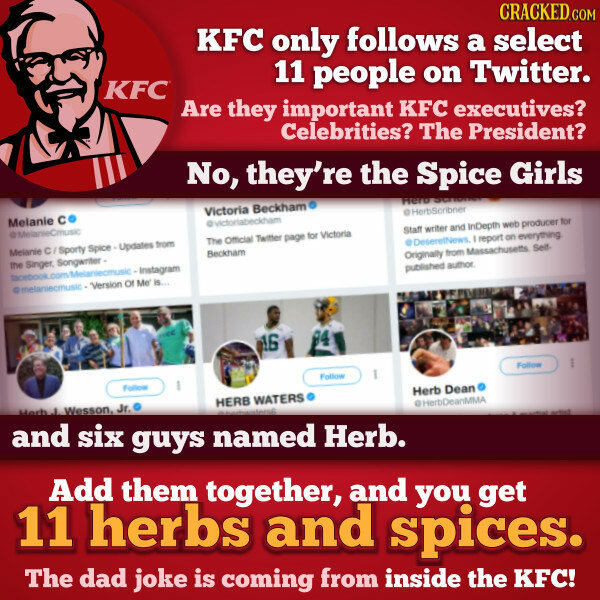 Someone on Twitter made the revelation of the century: KFC set up a dad-joke mine years ago that finally exploded. Well done, KFC. Both your chicken and your joke. But imagine being one of these guys named Herb, who thought they were special friends with KFC. For years, you’re one out of 11 people that KFC follows. “Are we friends? Are we… best friends?” you would wonder. Maybe it was a mistake. Maybe an intern, hopped up from huffing deep fryer fumes, accidentally friended you. But for years and years, you remain their friend. You go through many things: marriage, divorce, the birth of your child, the death of your dog. But through it all, KFC has been there for you. KFC selected you, out of its millions upon millions of daily customers, to be their friend. You’ve been through many hardships, but the fact that KFC sees something special in you has given you hope, the strength to get through and come out on the other side. But it was all a dad joke. A very clever marketing stunt. You were a pawn in their long con. You weren’t Herb to them, you were just an herb, to toss on their chicken and throw away. They chose you not for your heart, but for your Herbiness. That’s not finger lickin’ good. That’s not finger lickin’ good at all.